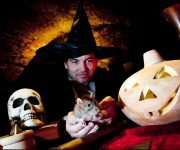 Head on down to Dudley Zoo this half term for some spook-tacular fun, including a ghost trail around the 11th century castle grounds. 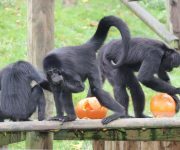 Our Colombian black spider monkeys certainly enjoyed tucking in to some tasty pumpkins and, with a ghost trail, creepy crafts, extra animal talks and two ghost and history walks each day, there’s … Continue reading Boo from the Zoo! 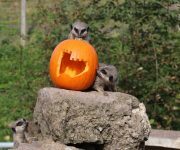 Visit DZG for some frighteningly family friendly fun this half term and get discounted entry in return for a carved pumpkin for our Halloween pumpkin patch! As part of our Freak Week we’re offering an adoption of Narna, our three-year-old flightless Egyptian fruit bat, for the best design. 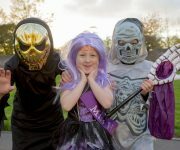 Running from Saturday, October 21 – 29, … Continue reading Half term Halloween fun! 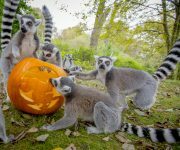 We had a fang-tastic October half term as we welcomed more than 9,000 people on site to enjoy our Freak Week activities. 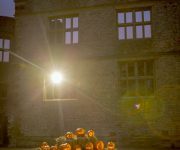 And huge thanks for the talented visitors who brought a carved pumpkin for our Hallowe’en pumpkin patch competition, and enjoyed discounted admission in return for the donation. 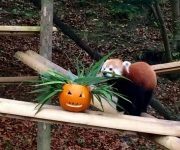 Marketing Manager, Andrea Hales, pictured above … Continue reading Fang-tastic pumpkin effort! 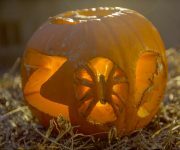 Spiders may be one of the most feared animal species in the world, but for DZG’s Weekend Keeper, Sarah Redding, they’re a life’s passion! 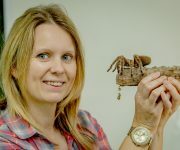 Currently the 40 year-old owns 23 tarantulas which she keeps in tanks in her bedroom, including the world’s largest – the Goliath birdeater, called Bridget, who’s the size of a dinner … Continue reading Spider-Girl Sarah!